I'm trying to do better at using some of the materials I'm always bring home ... my found objects. I said I was going to randomly picked something at least twice a week and create with it. This morning, I opened one of the 'hanging objects' containers, reached in with eyes closed and came out with a small set of red hearts. And, since the buttons are still calling me, thought I'd add 5 of them into a bead, button and heart charm bracelet. So, drilled little holes in the hearts, selected a variety of beads and buttons and pulled out the container of findings. I started with the 5 hearts on the bracelet, and, deciding it was too chunky, changed it to 3 hearts. And then, after getting half the beads on, decided they were still too chunky and removed the hearts altogether ... back into the container and back into the drawer for some other random pull ... lol. 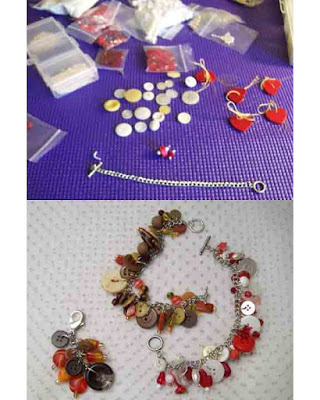 But, continued on in bits and pieces and before the day was over, created two bracelets and another pull. What do you think?